Folorunso Alakija doesn’t know if she is the richest woman in Africa ! 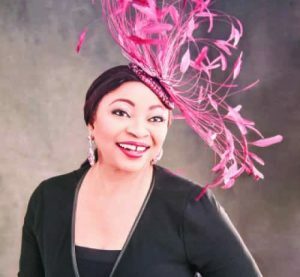 Oil magnate and Founding Grand Matron, Africa Cinematography Festival (ACF), Mrs Folorunso Alakija has been acclaimed the richest woman in Africa. In 2014, she unseated talk-show celebrity, Oprah Winfrey as the richest woman of African descent. The group Managing Director of The Rose of Sharon Group and Executive Vice-Chairman, Famfa Oil Limited according to Forbes has an estimated net worth of $2.1 billion.Recently, Effects met her at the unveiling of ACF; an initiative meant to harness the potentials of Nigeria’s entertainment industry during which she kept faith in Nigeria. This, she juxtaposed with exploring Nollywood as a vehicle of rebranding Nigeria. The philanthropist also spoke on her youthful looks at 66 and her road to success. At 66, how do you relax? If I tell you how I relax, you would be shocked! I relax by working and doing more work. That is because I enjoy working. However, I look forward to the time I can relax with members of my family. Aside that, I enjoy doing the work of God so much. What are the secrets to your ageless look? I want to attribute it to God’s grace upon my life. I started exercising my body about three or four years ago. Three times in a week, I seek the every opportunity to tell my trainer not to come to my place (laughter). I don’t know if that has anything to do with the youthfulness you’re talking about. I eat anything and everything. So, I don’t think it is has anything to do with exercising. I am learning to eat right. In totality, I would attribute it to the grace of God upon me. Coupled with that is the fact that I’m surrounded by friends and family members who give me peace. So, if you have peace, you would have joy and if you have joy, you would look younger than your age. I attribute everything to God. What would you want to be remembered for? I have heard that several times and I’ve found it difficult to answer the question. In fact, I want to live that question to those coming behind me to answer. Maybe, someday when I must have gone to the great beyond, I can look down and begin to listen, watch and hear what they have to say about me. How do you feel when people refer to you as Africa’s richest woman? I didn’t say so. But if that is what people say, I claim it and I pray that the Lord will do more for me in Jesus name. What advice do you have for women entrepreneurs? What I have to say is that they must make sure the venture is coming from their hearts; it must be their hearts desire because there are many challenges to be faced. Nothing goes from the lowest to the highest level overnight. Perseverance is a tool that we must imbibe and they must realise that nothing drops on anybody’s laps just like that. So, working hard to achieve an objective is key. Anybody can aspire and want to be one thing or another but I assure you, there are challenges along the way; there are numerous hurdles. So, that you desire it and want it does not mean that you will achieve your dream so easily. Implication, they must be ready to face the challenges they will meet along the way. But they should look at the light at the end of the tunnel. They should find that light and make their way towards it because there is light at the end of the tunnel. Distractions will come, challenges will come but if you are focussed right from the beginning and if it comes from your heart that you want to be this or that, including becoming an entrepreneur, they will achieve it. Can you share with Nigerians, the challenges doing business in Nigeria? There are many challenges doing business in Nigeria. There is no way we will talk about it and not mention corruption. Corruption will face you stark naked but you have to confront and overcome it and the only way you can overcome it is by holding strongly to your God. You have to trust God for everything, do you understand? God will always make a way for you.There is no way you will talk about God and you would not face challenges. There will always be issues when you’re asked to do things your religion doesn’t permit. It depends on how you talk to your God. He will always make a way for you. Another challenge is infrastructure deficit in your area of business or whatever you do. Starting with electricity. If there is adequate power, profit would be doubled. However, you will face challenge from people who want to take away what you have made. I am talking about armed robbers and those who believe that what you have belongs to them. They will always complain ‘why should it always be you you and not them.’ Road networks is another challenge. Funding is another challenge. Which bank will believe in you and want to invest in your dream. But I always advise. start small. I’m the greatest advocate of Ayo Megbeope who started her moi moi business with N1000 and today she is raking in hundreds of thousands of dollars in turnover and that has brought her into the limelight. The fact that she started small, she was focused and determined landed her in the white house on two occasions. The list is endless but like I said, you must be focused and determined and to achieve your dreams. What was the greatest decision you ever took? That was becoming born again and I thank God that I took that decision. That was 26 years ago. It was a sad experience I had and I was looking for God everywhere and I realised that the place to find him was in my heart. God told me to surrender my heart to Him and I gave my heart to Jesus.